In a small bowl, mix all ingredients for vinaigrette. 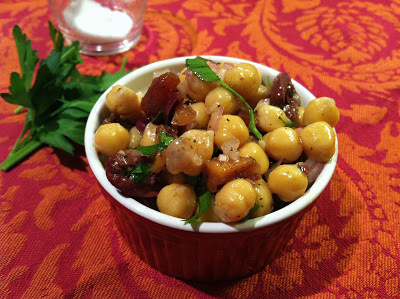 In a large bowl, combine beans, apricots, parsley and olives. Add vinaigrette to beans, mix to coat. Let marinate for at least an hour* before serving at room temperature. *Even better the next day, so make extra! I just sampled this at the new Tacoma Grocery!I loved it, and bought some for lunch.Everyone is thinking about dieting this time of year…do you know an approx. calorie count on this dish? My girlfriend made this recipe the other night and it was DELICIOUS! I was very skeptical when I first read this post. I’m not a big fan of fruit-meets-savory. 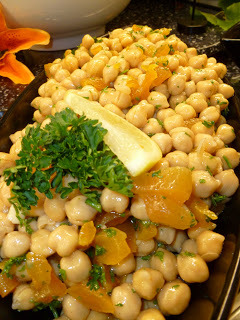 However, my love for garbanzo beans outweighs most biases so I went for it. This is AMAZING. I love all olives, but kalamatas can get a little intense. The apricot solves that problem, easy. Even my olive hating friends were indulging. Although while making it I endured some intense Pagliacci flashbacks (rinsing and draining garbanzo beans, quartering kalamatas, mascara running from cutting onions, chopping parsley – all daily occurrences), the final result was well worth it. In the future I’ll probably put less shallots in, mostly for the sake of those who have to smell me… Thanks Christina, its fab! I never think about the mascara/onion/silent crying situation when I start cutting, but soon it's all down hill. Here's something weird I've noticed, when I cut onions wearing contacts, they don't bother me at all. Contacts are like little onion-bubble-shields. When wearing glasses, my eye make-up (which is usually heavy) streams down my face. Thus, my suggestion is to grab those swimming goggles you only use once a year and see if they protect your tear ducts. I'm pretty sure they'll do the trick. I find that cutting onions under water takes care of this problem. Great tip Gary. I’ll have to try it! I just saw you make this on KCTS and am crying because I don’t have the ingredients on hand to make it right now. It looks and sounds delicious! I will try it soon.